In 1913 the leader of the Vietnamese revolution was working as an assistant cook in the Carlton Hotel in London's West End. The hotel in the Haymarket is long gone and this plaque can be found on its modern replacement, currently the Australian Cultural Centre. 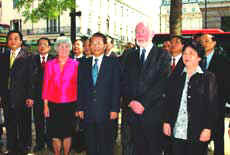 Vietnamese President Tran Duc Luong, during his state visit to Britain in May 2004, honoured the site where Ho Chi Minh lived and worked in London in 1913 by laying a wreath by the plaque.